A few days ago, I received an email from my high school coach asking me about the "correct" way to calculate percentages of a given pace. This is a question that I am asked fairly frequently, and the answer has a few interesting angles, so I have decided to make a post about the details. Many different training programs are predicated on doing workouts, easy runs, and interval sessions at various percentages of a particular pace, whether this is race pace or threshold pace or VO2 max pace. But if you ask a group of people how to calculate, say, 85% of 5:00 mile pace, you'll get two different answers. The first camp will say, "Simple, just multiply 5:00 per mile by 1.15, which gives you 5:45 per mile." The second will say, "No, you have to divide 5:00 by 0.85, which gives you 5:53." Who is correct? In some sense, they are both correct. To break down what each of these particular strategies actually mean, mathematically speaking, it helps to compare and contrast the result for a variety of percentages. So, sticking with our example of 5:00 mile pace, let's do the math on a few various paces, both faster and slower than 5min-miles. To make things simple, let's call one variant—85% = 5 x 1.15— the "multiplication method" and the other—85% = 5 / 0.85— the "division method." Plantar fasciitis is a vexing, persistent, and fairly common injury to the plantar fascia, the thick, fibrous band that runs along the bottom of your foot. While it accounts for around 8% of running injuries,1 it is also quite common in the general population.2 Unlike many running injuries, it is slightly biased towards men; one study found that, of 158 runners diagnosed with plantar fasciitis at a sports medicine clinic, 54% were men.1 Plantar fasciitis is by far the most common cause of "heel pain," and a quick internet search for that term will turn up a slew of podiatry websites which specialize in treating plantar fasciitis, both in athletes and in sedentary people. While not technically correct, plantar fasciitis is often referred to as having "heel spurs." Ironically, despite its commonality in both active and inactive people, and despite the fact that it makes up a huge percentage of the patients at podiatry offices across the country, plantar fasciitis is a poorly-understood injury with no solid slam-dunk treatment or even a firm theoretical underpinning of the mechanism of injury. Regardless, we'll dive into the wealth of research on it to learn what we can and inform our treatment and prevention approach. The plantar fascia as a whole is comprised of several bands of connective tissue that run along the sole of the foot, anchoring the metatarsal heads to the calcaneus (the heel bone). While there are several separate bands, the most important is the central aponeurtoic band. It runs from the medial side of the heelbone, fanning out as it attaches to each of the five metatarsal heads. At the heel, the center band of the plantar fascia is thick and has a triangular cross-section. The central band handles the bulk of the strain on the plantar fascia, and as such is the part most susceptible to injury. Some sources describe the entire collection of plantar bands as the "plantar fascia," while others refer to it as the "plantar aponeurosis" and the central band as the "plantar fascia." 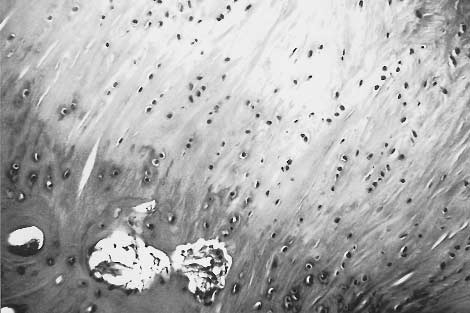 Microscopic image of a healthy plantar fascia. From Lemont et al. 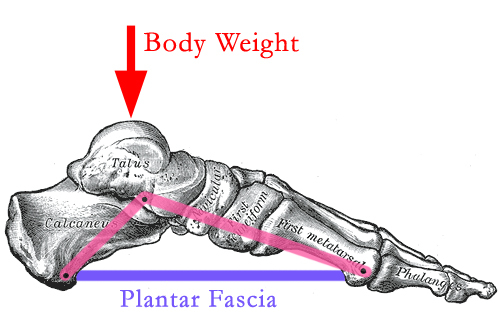 The plantar fascia acts like a tie bar, helping to support the arch of the foot when it is loaded.